Firefighters trying to extricate the victim from the wreckage. BINTULU: A male driver was killed after the car he was driving collided with a lorry at Jalan Batu 6 here early yesterday. 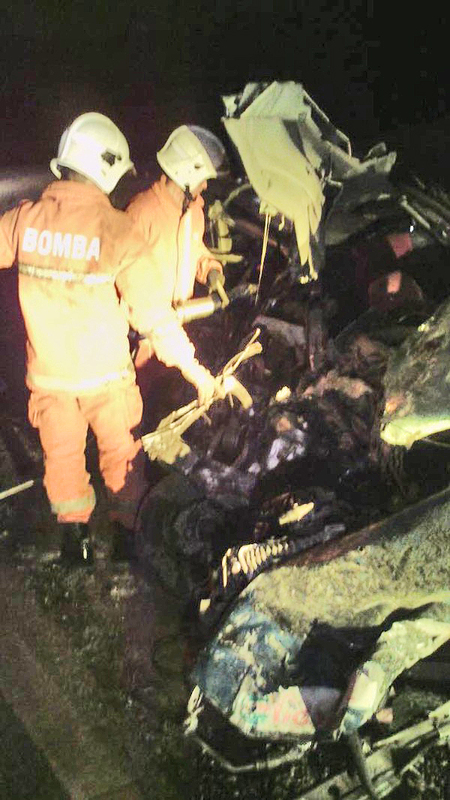 Bintulu fire station chief, Di-Hatta Gobel said Jimbun Uguom, 44, who was driving a white Perodua Viva car, died on the spot in the 4.30am crash. He said the lorry driver, believed to be uninjured, had fled the scene. He said prior to the accident, the lorry was believed to be heading towards Bintulu from Miri while the Perodua Viva car was heading towards Miri from Bintulu. “Seven personnel with a fire engine and an EMRS vehicle were dispatched to the scene to extricate the victim who was pinned to his seat,” Di-Hatta said. He added that the victim’s body was handed over to the police for further action. Man killed in car-lorry collision 0 out of 5 based on 0 ratings. 0 user reviews.